Sure, there are plenty of style crushes to be had among the entertainment industry’s elite, but if we had to name one celeb who’s been catching our eye in all the right ways for the past few years, it’s none other than Harry Styles. From Gucci shirts and chokers to that simple It factor, the artist looks good in literally anything. Of course, there’s one trend that has become practically synonymous with the “Kiwi” singer: printed suits. We could wax poetic about Styles’s fashion sense and the number of trends he’s perfected, but let’s face it: Nothing makes a statement quite like those printed suits. Whether he was wearing them for television appearances or his world tour shows, there’s no doubt that he was ahead of the curve with this one. Ready to take on the style of a rock star? We’ve rounded up the coolest head-turning suits to wear everywhere from the office to special occasions. You’ll feel as confident and cool as Styles himself, guaranteed. With the Combi Print Pants ($80), you’ll have an outfit worthy of an Instagram or two. This will brighten up anyone’s day. With the Joyce Trousers ($895) and a pair of classic pumps, you’ll feel so chic. Paired with the Tweed Cropped Trousers ($316), this is one suit we’ll never tire of. Chloé does it again with this blazer and Printed Cotton-Blend Corduroy Slim-Leg Pants ($1050). 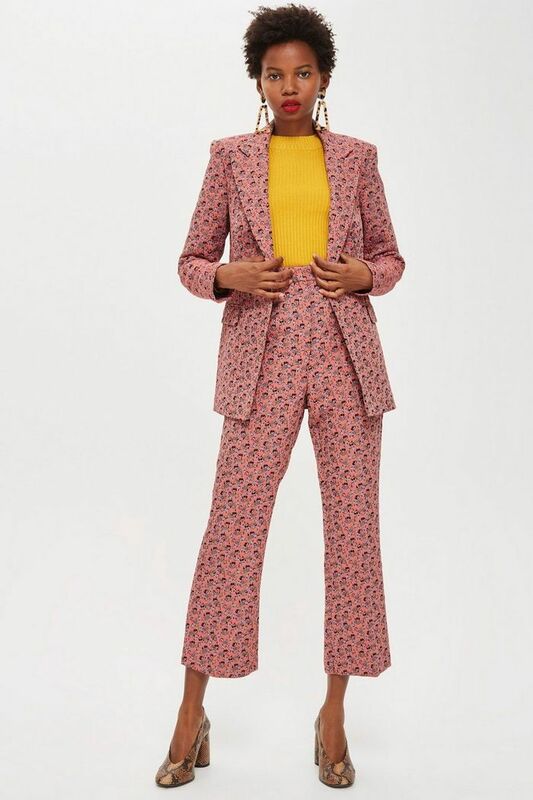 Buy the matching Floral Suit Pants ($45) and wear a sleek button-down underneath. Wearing this blazer with the Cindy Pants ($229), you’re bound to turn heads. With the Plaid Split Back Relaxed Ankle Trouser ($37), you’ll get all the right kind of attention. Worn with the Stella Tartan Wool Pants ($595), this makes an admittedly mesmerizing suit. Wear this blazer with Floral Jacquard Pants ($50) for a perfect party outfit. With the Checked Wool-Blend Pants ($1595), you're ready for fall. Pair this blazer with the Cyrus Velvet Pant ($338) for an ensemble that'll stun. Alexa Chung nails it with this blazer and the matching Floral-Jacquard Flared Pants ($560). With the Arabesque Printed Cotton-Velvet Flare Pants ($535), this is a look. Wear this all fall with the coordinating Rosemarie Pants ($168). Styling this with the High Ikat Jacquard Trousers ($65), you’ll be set for any holiday season occasions that lie ahead. Style this with the Taylor Leopard-Print Straight-Leg Pants ($670) and a pair of sneakers or heels. With the Left Eye Plaid Pants ($350), your outfit will be a conversation starter. With the coordinating Patterned Suit Pants ($99), you’ll be ready for fall. Yes, you need this blazer and the Cigarette Pants in Leopard ($48). Fall in love with this blazer and the matching Wide Leg Pants ($583). There’s a reason Harry Styles loves a good printed suit. Once you start wearing these, you won’t be able to stop.